Let’s catch up on a few events of immediate interest. 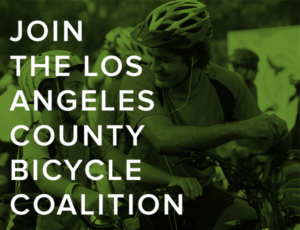 First up, the Los Angeles Bicycle Advisory Committee is meeting at 7 pm tonight in the LAPD Hollywood Division Community Room, 6501 Fountain Ave. This month’s agenda includes discussion of the role of the committee in the city’s Vision Zero plan, and why we’re not going to see the planned Northvale Bike Path that was supposed to run parallel to the new Expo Line extension. The BAC is the only official voice bike riders have in city government. And in theory, at least, its members should have the ear of the councilmembers who appointed them. The Los Feliz Neighborhood Council is hosting a community forum to discuss LA’s Mobility Plan 2035 from 7 to 9 pm tonight at 1965 N Hillhurst Ave. The good folks retroactively fighting the Rowena road diet, along with those who want to Fix the City by keeping our streets dangerous, will undoubtedly be there. It might not hurt to have a few rational bike-friendly voices in attendance to balance the scales. Thanks to BAC VP Glenn Bailey for the heads-up. It’s Rideshare Week, when Metro encourages you to carpool, ride bikes, take public transit, walk and vanpool to your destination. First among these new initiatives, Metro has launched a new Rideshare campaign to encourage Angelenos to bring a friend along for the ride as opposed to driving alone. Statistics show that in California 37.3% of Greenhouse Gas (GHG) emissions come from transportation, 71% of those emissions are from passenger vehicles, and 72% of commuters are driving alone. If every commuter were to involve one other person in their commute mode, then traffic would disappear and GHG emissions would greatly reduce. New campaign ads, titled “Friends don’t let friends drive alone” will appear online and on giveaway items available at events. Innovate LA with the Karaoke Rickshaw — Movable Parts, an artist collective of college professors, engineers, city employees and creatives, will construct and deploy a Karaoke Rickshaw. The bicycle powered machine will tour through various LA neighborhoods amplifying street sounds, interviews, and multi-lingual pop hits. The finale performance will take place at LA Innovation Week’s Innovate Pershing Square event on October 9. Share the Ride to Ambulante Film Festival — Empact Communities, a grassroots bicycle advocacy group, has partnered with Metro to facilitate ridesharing to Ambulante Film Festival. Group bike rides led by Empact partners will bring attendants to several film screenings. All Ambulante events will be registered in www.Ridematch.info, a database website that facilitates carpooling with more than 300,000 users. ¡Mobilizaté! Eastside Commuter Interviews — Multicultural Communities for Mobility (MCM) will convene along popular transit lines in East LA and Boyle Heights to engage ridesharers to share their street stories through a photo or short video. All stories will be captured through Twitter and Facebook and tracked by tagging @mcmhandles, @metrolosangeles and #SharetheRide. Third, Metro is giving away prizes to commuters who register their rideshare trip using www.ridematch.info. Prizes include handbags from Brighton Collectables, Metro 7-Day TAP Passes, Barnes and Noble gift cards, Macy’s gift cards, gas cards, and more. Special thanks to Macy’s, Burbank TMO, AAA, VRide, Brighton Collectibles, and Enterprise Rideshare for the donations! Bicycling recaps the Richmond world championships, concluding they were utterly unforgettable. VeloNews asks if pro cycling’s WorldTour points championship really means anything. Be honest, did you even know there was a points championship, let alone that Alejandro Valverde won it? I didn’t think so. Two-time Giro winner Ivan Basso retires at age 37, after successful treatment for testicular cancer. Sad to see Basso go out like that. In his prime, he made Lance work for every now-discredited victory. Another great, if difficult, read from Streetsblog’s Sahra Sulaiman as she looks at the anniversaries of the hit-and-runs that took the lives of cyclists Andy Garcia and Benjamin Torres; the 21-year old drunk driver who killed Garcia and seriously injured two other riders is already out of jail after serving just 16 months of a 42 month sentence. Meanwhile, there will be a ride calling for justice for Torres on Saturday to mark the third anniversary of his still unsolved death. Councilmember David Ryu’s office is amassing a database of broken sidewalks and cracked streets, and vise versa, that need repairs in the 4th council district. Thanks to David Wolfberg for the tip. Tired of ticketing cyclists for riding salmon on a one-way street, UCLA responds by devoting half the street to what may be the LA area’s first contraflow bike lane. Update: Richard Risemberg points out there’s a contraflow bike lane on Marengo in Pasadena. USC is now requiring all students, faculty and staff to register their bikes before parking them on campus, ostensibly to combat bike theft. 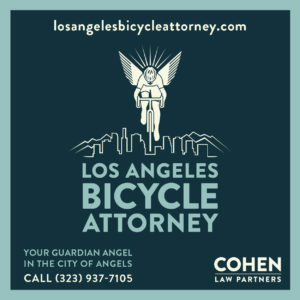 However, mandatory bike registration programs can easily be used as an excuse to stop and search bike riders in the absence of probable cause, which is why LA’s registration program was repealed in 2009. Continuing our school report, it’s Bike It! Walk It! Bus It! Week at Santa Monica public schools, while LA has 126 schools signed up for Wednesday’s Walk to School Day. Riding a bike to LA schools seems to be acceptable, as well; walking the last few steps after arriving in Mom’s massive SUV, not so much. The anti-bike lane madness continues in San Diego-adjacent Coronado, where apparently any bikeway inspired, designed, assisted or implemented by anyone who doesn’t live on the island must be some sort of plot. And that goes for traffic lights, too. That town may be in more desperate need of a civic colonic than anywhere else on earth right now. Temecula plans to put the fun in Fondo — just go with it — at the grammatically challenged first annual Temecula Spandex Stampede Cycling GranFundo on November 8th. It may be the first of what’s planned as an annual event, but can’t be called that until the second one. Hey, I don’t make the rules. A former volleyball player who won a gold medal with the US team at the 1984 LA Olympics was seriously injured when he was hit by a pickup in Santa Barbara, after he reportedly ran a stop sign on his bike and rode on the wrong side of the street. The San Francisco Chronicle looks at the Idaho stop law, which has become a political hot potato in the City by the Bay; a 2010 study shows it reduced bike collisions by about 30% without causing any known problems. But as everyone likes to say, San Francisco isn’t Idaho, and LA is Copenhagen. Which is just an excuse not to try something that has been proven effective somewhere else. A former star of the long-running soap opera The Young and the Restless was just two riders back when a rider in Sunday’s Levi’s GranFondo tragically rode off the roadway. Still more bad news from NorCal, as a Dixon driver is under arrest for felony charges of DUI and voluntary manslaughter after fatally rear-ending a bike rider on Sunday. Garmin has released a new rear-facing radar that tells you when cars are coming from behind; the unit also includes a taillight that dims to save battery life when there’s no one behind you, and brightens to save yours when there is. Boulder CO begins undoing the right-sizing of a city street. Which would seem to be wrong-sizing, mais non? 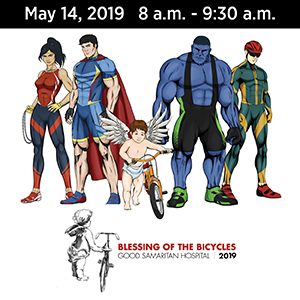 A moving story from Kansas, as 32 cyclists from a four state area come together to help a five-year old boy suffering from life-threatening aneurisms go for his first bike ride. 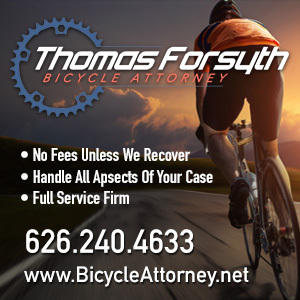 An Illinois man gets 55 months in jail for killing a cyclist while driving aggressively under the influence. A new under-two-minute film looks at a 49-year old Minnesota firefighter who is also a champion track cyclist. Pittsburgh’s bikeshare system is exceeding projections by averaging 12,000 rides a month. A handicapped Pennsylvania man was rescued after being trapped for two days in a 300-yard bike/pedestrian tunnel when his motorized wheelchair stalled. An Albany NY writer says it’s time to stop the debate over a proposed road diet and just do it. A New York city councilman wants to remove 400,000 cars from the city streets by 2030, in part by subsidizing the city’s bikeshare system. Think an LA councilmember would ever have the courage to call for removing nearly a third of the cars from our streets? Me neither. The New York Times looks at the efforts of São Paulo’s mayor to shake off the city’s dystopian sprawl and automotive hegemony by making room for bikes, buses and people on foot. A bike advocacy group on Canada’s Prince Edward Island calls for mandatory use of flashing daytime bike lights to stop an apparently non-existent rash of bike wrecks; a police source says the island experiences a whopping seven to fourteen bike-involved collisions each year. The same group wants to take over a program to enforce helmet use, as well. Maybe they define bike advocacy a little differently up there in the Great White North. Thanks to Lester Walters for the link. In a tale that will sound familiar to anyone who’s followed the debate over bikeways in New York, London or right here in LA — or just about anywhere else – residents and business owners in a British town are up in arms over plans to make the city center more walkable and bikeable, even though studies show they would actually benefit from plans to de-emphasize cars. Irish police ticket 244 bicyclists after new rules went into effect allowing on-the-spot fines. A new Irish study says bike helmets are effective protection in collisions up to 31 mph, and not much good above that. Only 18% of bike-riding Amsterdam club goers use both front and back bike lights. On the other hand, if you’re going to go lightless, that’s probably the place to do it. Sixty Mangalore, India cyclists rode to save the embattled Netravathi river. Two South Korean women completed a 3,300 mile ride across the US to raise awareness of Korean comfort women forced into sexual servitude by Japan in WWII. Lots of people bike to work; not many do it on a Penny Farthing, though. Don’t express your anarchist leanings by jogging in a DC bike lane or you could face a whole $10 fine. And who’s the criminal if you break into a home to steal back your stolen bike after spotting it on Craigslist? Which is not to say I wouldn’t do the same damn thing.